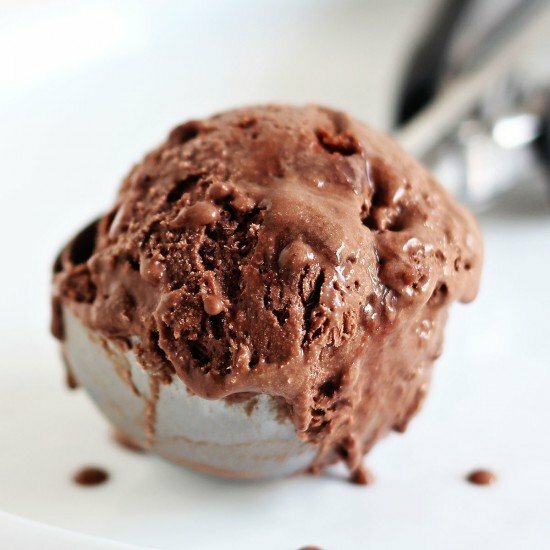 Death by Chocolate Ice Cream features an ultra rich, thick, and creamy double chocolate custard-based ice cream with chocolate fudge swirled throughout. 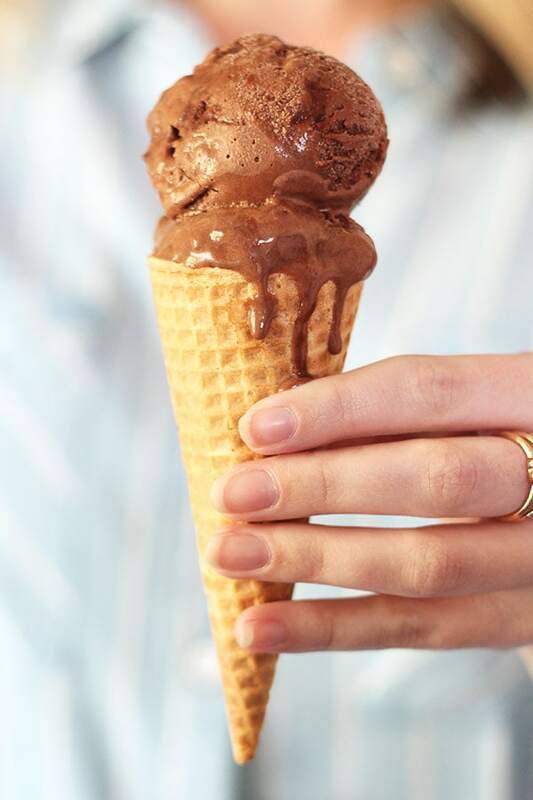 Every bite is a chocoholic’s dream! Taste: Ridiculously chocolaty without being bitter or overwhelming. Texture: Perfectly rich, luscious, and creamy. The slightly chewy and thick fudge swirl just takes it to a new level! Ease: This is a custard-based ice cream recipe, so there are a few extra steps and waiting periods involved. I promise it’s worth it! Pros: Possibly the best chocolate ice cream ever. Would I make this again? Oh yeah. Without a doubt! Did you know that I published a cookbook all about homemade ice cream sandwiches a few years ago? I tested *hundreds* of batches of ice cream and got to the point where I was convinced I could have made perfect ice cream in my sleep. Writing a cookbook is a crazy whirlwind undertaking and now I have flashbacks to those messy, stressful, wonderful days any time I make ice cream. I actually made so much ice cream back then I had to buy another freezer. SO, basically what I’m saying is that whenever I share an ice cream recipe, you know that I’ve got you covered. 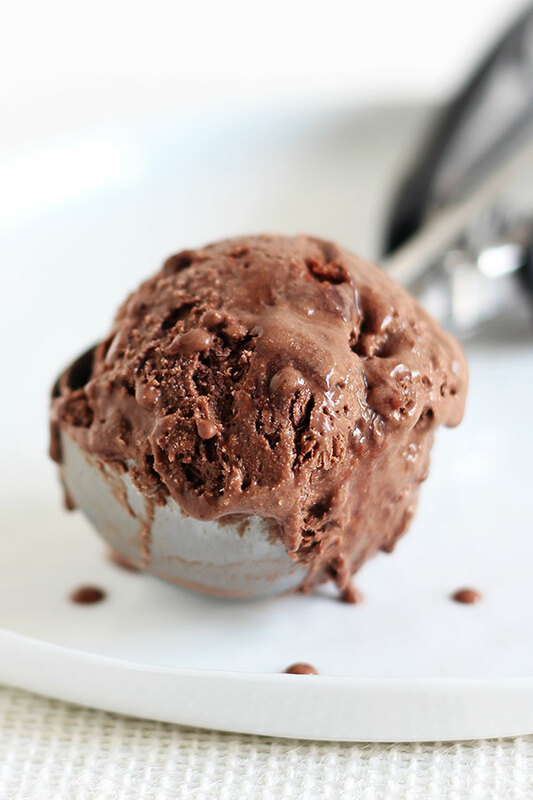 It’s gonna be good and this Death by Chocolate Ice Cream recipe is no joke! For serious chocoholics only. I have a full step-by-step video tutorial on how to make custard based ice cream here. If you’ve never made custard ice cream before (where you cook an egg, milk, & cream mixture on the stove) then I highly suggest you watch it before making this recipe! Do not substitute low-fat dairy products in this recipe. The fat in the cream and whole milk help give the ice cream its luxurious smooth and soft texture. Same goes for the sugar. The sugar and fat help keep the ice cream soft. Prepare the ice bath before you cook the custard so that you can immediately remove it from the heat and strain it into the ice bath. This stops the cooking process, preventing the custard from becoming overcooked. Overcooked custard will curdle. Be careful when tempering the egg yolks. Whisk constantly as you slowly pour the hot cream mixture into the beaten yolks. This process allows you to gently heat the yolks so you don’t scramble them and end up with chunky ice cream. For best results, use an instant-read thermometer to cook the custard to 175°F, or until the custard coats the back of a wooden spoon. If the mix is off by a couple of degrees, that’s fine. Whatever you do, do not stop stirring and do not let it boil. I used my trusty Cuisinart Ice Cream machine to churn this ice cream. I’ve made literally hundreds of batches of ice cream in this machine and it’s never failed me. If you’re using a machine like this, just make sure the freezer bowl is COMPLETELY frozen otherwise you’ll end up with soup instead of ice cream. I like to freeze mine overnight just to be sure. Also make sure your custard mixture is completely chilled before churning, for the same reason. Everything needs to be cold cold cold. Although using an ice cream machine is the easiest way to get beautifully rich and creamy ice cream, I got you covered if you don’t have one. I have a full video tutorial showing you three ways to make ice cream without a machine here. Store the ice cream in an airtight container with a sheet of plastic wrap pressed against the surface. This will help prevent ice from forming. The longer you freeze the more time the flavors will have to ripen. 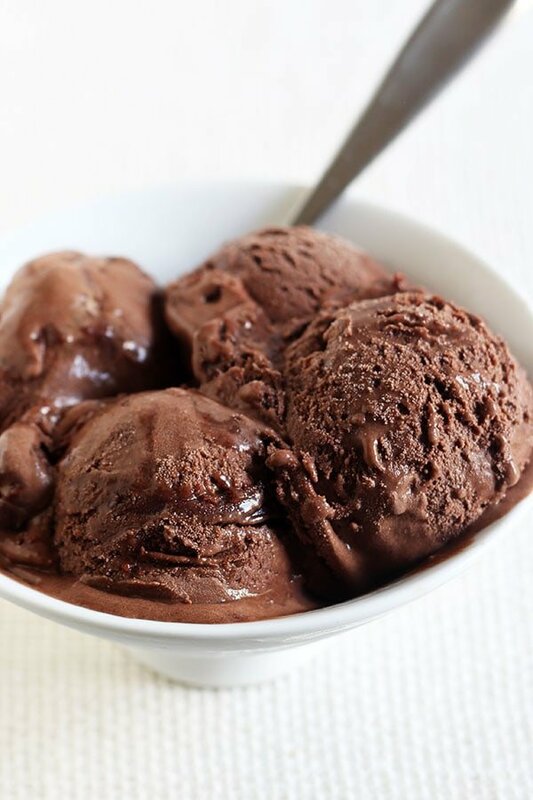 If the ice cream is in the freezer for an extended period of time, let it sit at room temperature for 5 to 10 minutes before scooping and storing so it can soften. Remember, this is homemade stuff so there’s no stabilizers or softening agents in it! This ice cream scoop makes even the hardest ice cream scoop like butter. Store for up to 2 weeks in the freezer, though I doubt it’ll last that long! In a medium saucepan, combine the milk, cream, 1/2 cup sugar, cocoa powder, salt, and vanilla. Set over medium heat, stirring occasionally, until the mixture is warm and begins to steam, about 5 minutes. Stir in the melted chocolate. Whisk together the egg yolks and remaining 1/4 cup of sugar. Carefully whisk half of the warm milk mixture into the egg yolks, one ladleful at a time, until the egg mixture is warmed. Whisk the egg-milk mixture back into the saucepan. Cook the mixture over medium heat, stirring constantly with a wooden spoon, until the mixture is thick enough to coat the back of the spoon and registers around 175°F on an instant-read thermometer, about 5 to 7 minutes. Be careful not to boil the mixture. Immediately strain the mixture through the fine strainer into the prepared ice bath. Cool the custard in the ice bath until it reaches room temperature, stirring often. Press plastic wrap against the surface of the custard and refrigerate until chilled, about 4 hours or up to 1 day. Heat the cream, butter, and sugars in a small saucepan over low heat. Bring the mixture to a boil and cook until the sugar dissolves, about 2 minutes. Remove from heat and stir in the chocolate chips. Let stand for 3 minutes before stirring completely smooth. Stir in the salt and vanilla. Let the mixture cool to room temperature before using. Fudge swirl can be stored in an airtight container in the fridge for up to 2 days. Bring to room temperature before using. Pour the mixture into an ice cream maker and freeze according to the manufacturer’s directions. Transfer the ice cream to an airtight container in batches, spooning the fudge swirl in between layers of ice cream in a swirled pattern. Press plastic wrap against the surface of the ice cream and freeze until it is firm, about 3 hours, before serving. OH MYYYY this ice cream looks like something out of a dream! Once I get a bigger kitchen I’m definitely going to be buying an ice cream maker. Death by chocolate is so decadent and delicious, I cannot wait to make this one day. Pinned!